Nursing is a career with a truly universal impact. In countries all around the world, you will find people who are doing the important work of nurses — caring for patients and advocating for their health. Jamaica C., Professional Staff Nurse at UPMC Presbyterian, can attest to this fact firsthand. She never would’ve anticipated that her nursing career would take her halfway across the globe from her homeland, but she wouldn’t have it any other way. A native of the Philippines, Jamaica’s nursing story began in her home country. As a student, she received her Bachelor’s degree in nursing, and although she always had an interest in working abroad, she figured that her only opportunity to do so would be through a skilled visa. Everything changed for Jamaica when a friend introduced her to her future husband — an American citizen and a resident of Pittsburgh, Pennsylvania. As their relationship progressed, it became clear that America would be the place for them to settle down and start their lives together. So Jamaica’s life and career took a turn that she hadn’t expected: a move to Pennsylvania! Although Jamaica had received her nursing degree in the Philippines, the process of transplanting her life and career to America required a great deal of effort and dedication. Between submitting her credentials for review, taking the NCLEX exam, and sending papers back and forth between the United States and her school in the Philippines, Jamaica’s journey to America was not an easy process. 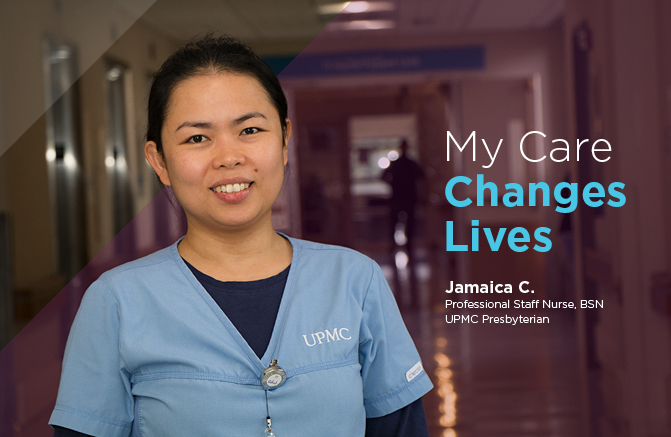 After a year in the General Medicine Unit, Jamaica left UPMC to pursue an opportunity at a different hospital. Before long, however, Jamaica decided to return to the place that she knew was right for her – UPMC. Upon her return to UPMC Presbyterian, Jamaica transitioned to working in the Rehab Unit, a department that she calls the “gateway to home.” Patients usually come to Rehab shortly before their discharge from the hospital, following a variety of treatments. In the Rehab Unit, Jamaica and her team provide care for stroke patients, transplant patients, cardiothoracic surgery patients, amputees, and more. This wide variety of patients has allowed her to develop skills across a spectrum of different nursing specialties. Several years into her career, Jamaica’s work as a nurse has come full circle. Her nursing career began on a bumpy road, as she struggled to transition her life and occupation across the globe and make her home in America. Nevertheless, these experiences and trials have prepared Jamaica for the care she provides today. Having found her home in Pittsburgh, Jamaica is now uniquely equipped to care for patients in the Rehab Unit as they make their transitions home, as well.